ca.1910, photograph by Edward S. Curtis. There is evidence of early human settlement on this continent dating from at least 25,000 B.C., long before recorded history began. Most scholars believe that Indians entered the continental United States from Asia, traveling across the Bering Strait and through Canada, between 25,000 to 8,000 B.C., when the land bridge existed. Others believe that Indians may have come north from Central or South America. (Or did they spring from the earth, as their own legends have it?) Surely there was movement back and forth between North and South America. Dr. Carl Dentzel, the late director of the Southwest Museum in Los Angeles, told me that he had carbon-dated Indian pots from 30,000 B.C. in North America. Most of our knowledge of the first American Indians is based on their claywork alone; fired clay is the only material on earth that does not change with time. North America provided a wide range of territory for these early people, from Arctic to subtropical climes. What is now the continental United States can be divided into five physiographic areas: the Great Plains of the Midwest and the Mississippi River lands, the arid Southwest, the West Coast seaside, the colder Northeast, and the warmer Southeast. Indians eventually grouped roughly into these regions - and from the very beginning, they made pots. About two thousand years ago, the beginning of agriculture in North America caused the previously nomadic Indian peoples to settle down. Soon, pottery shapes developed according to various customs and techniques of gathering water, storing grains and liquids, and preserving seeds for the next planting. The craft culminated in the development of cooking pots that were made to sit on rocks in open fires, water jars with indented bases so they could sit comfortably on the heads of water gatherers, and large storage vessels for grains and water. Indian villages all over the United States became known for their different pot shapes and decorative styles. Sometime during the early period of formalized agricultural practice, storage vessels for seeds and grains were needed. Hierarchies developed for the size, shape, and decoration of the pots for storing the best seeds, for different varieties of seeds, and so forth. Other hierarchical shapes developed historically for other practical reasons. Women were probably the gatherers (as men were the hunters), and women became the chief pottery makers. Initially, handbuilt vessels were made solely for utilitarian purposes, with little consideration for artistry. Most very early containers were unadorned, except for the texture of the coils and pinches, or indented textures from pointed sticks. Not much attention was paid to symmetry. Corrugated brownware; 61/4" x 5" dia. Santa Fe, New Mexico. IAF.1930. Later, decorative designs began to appear on Indian pots. Anglos have long struggled to find meaning in these designs, but Indians are reluctant to verbalize their meanings. If the symbols are important rather than mere embellishment, outsiders are not likely to be privy to the potter's intent. Indians do not divulge sacred traditions, ceremonial rituals, or symbols. From the earliest times, Indian tribes have venerated life, nature, birds and other animals, humans, and gods. Realistic and abstracted interpretations of these mentors probably form the basic elements of Indian designs for all utilitarian and ritual objects. No one knows why pottery became so important to all North and South American Indians for ceremonial use during rituals and burials. The use of pottery can be recognized in a religious and social context long before Columbus' arrival in America in 1492 and the Spanish conquest in 1540. These years, however, mark the end of the prehistoric period of Indian art, and the beginning of what is called the historic period. Pot shard traces left behind by potters over the centuries have enabled archaeologists to determine the probable origins of excavated pot remains, since all potters prospected clay and made pots near their dwelling places. Of course, pots may have been traded among Indian villages, but when many similar pots are found in one place, they were no doubt created there. From the beginning, Indian pots have been thinly fabricated and fragile before and during firing. Many thousands of pots were made over the centuries; thousands broke in the firing and many broke from use. To help protect the vessels from thermal shock during the sudden heating of the bonfire, some potters used ground-up, fired shards as temper in the raw clay. Other potters used volcanic ash, which they called "sand," an inert mineral that in itself is resistant to the shock of instant flame. Historians generally believe that fired clay pottery developed because ancient people lined their woven baskets with mud-clay. When the baskets were subjected to fire so that corn or other foodstuffs could be dried, the basket burned, leaving hard, durable clay intact. 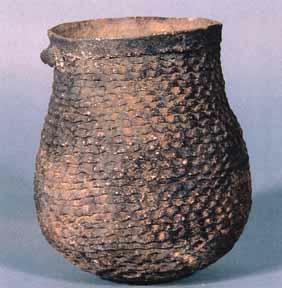 It is true that many primitive pots bear texture marks indicating that they might have been made in baskets. Still, there can only be guesswork about the origins of baskets. Did woven containers really come before clay pots? Excavations in some parts of the United States have yielded unfired clay pots that could not have been pressed in baskets. Vessels may have been fashioned for storage or for uses other than cooking food, unrelated to the basket-pot theory. The fact that fire could harden clay may have been discovered accidentally, not necessarily in mudded-up cooking baskets. Astonishingly, the potter's wheel was never used anywhere in either North or South America. The wheel was used for transportation and for tools, but was never adapted for clay. It may be that Indians just relished the experience of building a clay pot slowly by hand, using the painstaking method of coiling and pinching. Over the centuries, tribal groups from different regions have developed their pottery traditions in a variety of ways. The following is a discussion of some of the significant groups in the west. Southwestern Indian culture has changed little over the centuries, unlike anywhere else in Indian America; it is vital and timeless. The Southwest can boast the oldest continuous record of habitation on the continent, outside of Mexico. By the beginning of the Christian era, three primary southwestern cultures were forming: Hohokam (probably the antecedents of today's Pima and Papago Indians in Arizona), Mogollon (of which the Mimbres culture was the highest achievement), and Pueblo (which climaxed in the eleventh century in the Four Corners area of Colorado, Utah, Arizona, and New Mexico). Most of these ancient cultures vanished by the twelfth century, but the Pueblo and Navajo cultures continue today. Today, Southwestern pottery made in the existing twenty pueblos in New Mexico and Arizona, and by the Navajos in Arizona, remains one of the greatest expressions of ceramic art in the world. The continuity of these Indian cultures is assured as long as their belief systems remain intact. fig. 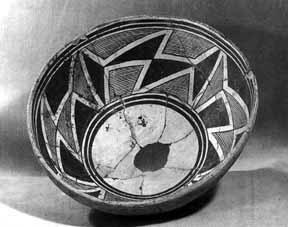 5: Mimbres burial bowl, (3) ca. A.D. 1000-1150. Museum of New Mexico. Photograph by Arthur Taylor. Through sheer strength of character and endurance, the Pueblo Indians survived the Spanish conquerors, the degradation of conquest, and the plagues that spread from Anglo diseases. Once the United States took over the land colonized by the Spanish, all other Indians in this country were repatriated to remote lands unfit for habitation or agriculture - at a great cost of life and emotional upheaval. The struggle for existence continues to this day, particularly in the pueblos. By and large, Pueblo people have not integrated and intermarried with Anglos, but have stayed in their assigned, segregated areas. Pueblo Indians remain within their boundaries on restricted reservation lands, with the pueblo at the center of their lives as the core of ceremonial activity. This cocooning has allowed these communities to preserve their traditions and customs like no other Indian group. Pueblo has two meanings. Literally it means "groups of houses." These houses are built of adobe clay or lava rock, and are plastered with lime and straw for stability. Long logs of lodgepole pine, called vigas, are dragged to the pueblo from miles away to serve as support beams for the roofs. But pueblo is also a concept; those who belong to a pueblo are obligated to participate in the ritual life of the community when they are asked. Indians who live on the reservation, but not in the pueblo, are not obliged to serve, though most do so when asked. Pueblo people put down roots and do not move. They observe rigid cultural restraints, such as not marrying outside the pueblo, in order to maintain membership in the group. They preserve a secretive and closely guarded barrier against all outsiders. Most pueblos are small, with populations ranging from several hundred to a few thousand. Frequent ceremonies serve to continue the oral teaching of each pueblo's heritage. Dances, songs, and legends are taught to every child as early as possible. All Indians preserve their culture with "powwows" and "doings," but Pueblo Indians are more intensely occupied with the preservation of ritual than most. Clay vessels have been made for storage and household use in these stationary societies for at least two thousand years. Each pueblo has developed a style of form and decoration indigenous to its needs and beliefs. These varying styles have been historically documented and attributed to particular pueblos since the Spanish conquest. Traditionally, Pueblo Indians prospected clays from their own secret ancestral clay sources. Most pots were smoothed to create burnished backgrounds for designs, which were painted with pigments made from residues of boiled plants or finely ground metallic rocks. Brushes were cut and shaped from the chewed ends of twigs or yucca fronds. Glaze was almost never used for a vitreous coating, nor was the potter's wheel ever used for fabrication. The pots were hardened in an open outdoor bonfire reaching 1,300 degrees Fahrenheit. These antique methods are preserved today. The railroad greatly affected Pueblo pottery culture, bringing curious and inquisitive tourists within reach of the artists. Soon, a great deal of Pueblo pottery was being made for sale as souvenirs. Traders were the middlemen; some settled near the reservations and set up trading posts that became famous. Fairs and markets, especially at Gallup and Santa Fe, promoted Indian pottery. Shops selling only pottery sprung up all over the Southwest. Among the most important merchants was the Fred Harvey Company, which sold Indian pottery in its chain of lodges, shops, and restaurants at railroad stations, national parks, and other key tourist locations throughout the West. fig. 6: Maria Martinez prepares for firing, (4) ca. 1920-25. © U.S. Department of Interior, Indian Arts and Crafts Board. Beginning in the 1920s, the best women potters were encouraged to sign their work, and soon they were the subject of much public acclaim from the outside world. At the same time, serious collectors of Indian art began to emerge, buying the best work. All of these selling possibilities brought some spectacular Indian women artists to national attention, as did the endorsement of art and history museums. Dr. Edgar Lee Hewett of the Museum of New Mexico and his colleagues at the Heye Foundation in New York and the Smithsonian Institution in Washington, D.C., sought out the best Pueblo women potters, purchased and exhibited their work, and hired the artists to demonstrate. A number of extraordinary women artists flourished in this atmosphere of encouragement. From these roots, dynasties began. Newly famous Pueblo pottery matriarchs, such as Nampeyo of Hano and Maria Martinez, realized the monetary potential of pottery as they also recognized the demise of their old ways due to drought and encroaching modernization. These women and others like them showed their progeny that pottery could be a source of income to help sustain their way of life. Pueblo culture and pottery culture help each other survive. ca. 1924. Courtesy of David Rockefeller. The Navajo Reservation, fourteen million acres of high plateau stretching from northeastern Arizona and northwestern New Mexico into southeastern Utah, is guarded by four sacred mountains: Blanca Peak, Mount Taylor, the San Francisco Peaks, and Mount Hesperus. The Navajo nation is the largest Indian group in the United States, with a population of two hundred thousand. Within the boundaries of the somewhat nomadic Navajo nation lies the more settled Hopi Pueblo, a contradiction that has caused problems for many years. The relationship between the Hopi and the Navajo is tense. Although most Indian groups (even outside the United States) have similar myths of origin, rituals, good and bad gods, and rules of behavior, different groups of Indians are not at all alike. Differences between the Hopi and the Navajo tribes have caused some political and social confrontations. Traditional Navajos live in round log-and-clay hogans and have "summer houses" made of branches and twigs, neither of which have water or electricity. Many are in the vicinity of Chinle and Canyon de Chelly, where many Navajo weavers raise their sheep. Clans are very important in Navajo life, and are the source of some of the emotions, remembrances, and cultural ties that influence pottery designs. 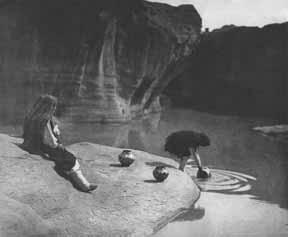 Tuba City, the tribal headquarters on the east side of the Grand Canyon, and springs in vicinities to the south, have sufficient clay in nearby locations for potters to gather. Unlike the Hopi, the Navajo were not traditionally artistic potters, although Navajo women have been making pottery for hundreds of years for their own household and ceremonial use. A few of them turned into artist potters when the railroad crossed America, and have begun to be a force in the Indian pottery market much like Hopi artists, who have long been successful. In this century, Navajos have achieved renown in weaving, silversmithing and jewelry making, basketry, and painting; probably more than in any other Indian culture, Navajo potters are enveloped in surrounding aesthetic inspirations. Navajo potters often mix several clays together, for varying physical and chemical as well as aesthetic qualities. Unlike many other tribes, Navajos do not grind up old pot shards to mix into the raw clay powder for temper, lessening the shrinkage and breakage during firing. Navajos feel that old pottery shards belong to the Anasazi, their forefathers, and should not be removed from the ground. The style of early Navajo pottery is in contrast to most pots made in other Indian villages in the United States. Fabricated in the coil and pinch manner of old societies, the work was bonfired - but then a unique treatment was used. Before the pot had cooled, hot melted pitch from piñon trees was poured or rubbed in a thin coating over the vessel, inside and out. 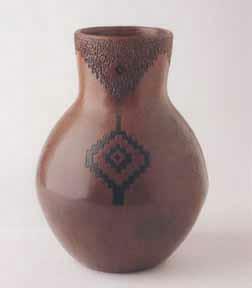 This unusual technique distinguished the look and aroma of Navajo pottery. Traditional pots were otherwise undecorated for centuries, except for textures that occurred in the fabrication, or the application of small symbols made of the same clay. Navajo tribal society was tightly controlled, and medicine men imposed restrictive behavior regulations upon the women making pottery. 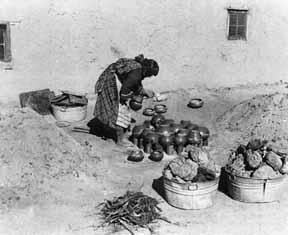 Possibly, the discipline imposed on Navajo women shows in the conservative nature of their pots. In the 1880s, the railroad crossed America and the first Anglo-run trading posts came to the Navajo reservation. Use of cash money instead of the barter system brought the Indians access to Anglo cooking products made of metal and plastic, diminishing the need for utilitarian pottery and undermining native tradition. Navajo women still made pottery for ceremonial use, but the lack of production reduced the stimulus for making any kind of pottery. At the same time - while artistic pottery from the southwestern pueblos was reaching a high degree of popularity - traders rejected the traditional Navajo pottery, calling the dark-brown, pitch-coated, utilitarian wares "mud pots." Tourist markets for Navajo blankets and jewelry were more profitable than the market for this kind of pottery. Another change occurred when curators from nearby museums began to notice a few emerging clay artists, who were taking traditional Navajo techniques to new levels. Rose Williams was the first traditional Navajo potter to break into the museum markets and fairs in the 1950s. She built cylindrical jars two to three feet tall, a quite exceptional size for handbuilt bonfired pottery. Her daughter, Alice Cling, was one of the first Navajos to sign a pot. Today Navajo pots are usually fired outdoors, one pot at a time in an open pit, with juniper wood both under and over the pot. The fires are allowed to burn hard for several hours. The pitch for coating the pots is gathered by children or families from piñon trees in an arduous process. Of course, everything about this process is arduous: digging the clay, grinding it to powder, coiling and pinching the clay into shape, gathering wood for the fire, tending the fire, and applying the hot liquid sap to the finished pot. The Navajo tradition of making illustrative symbolic sand paintings for healing ceremonies has given inspiration to some pottery decorations, although it is against traditional rules to use them. It is difficult for Indians to use sacred symbols for design; feelings of reverence and ancestral respect impose strong limitations. Still, tribal background is inevitably an important decorative resource. The Yei bichai, representing the mythical Holy People, are particularly prominent subjects in Navajo art. These appear often on pots by Lorraine Williams; she leaves a portion of the design unfinished so the Yei spirit can escape. featuring a symbolic Navajo design. Polychrome; 11" x 7" dia. Collection of Sue Totty. Today, most Navajo potters live in the Shonto-Cow Springs area of Arizona, where there is still a good clay source. Many of the potters in this and other areas are related directly, by marriage, or by clan. Traditional ways are handed down or handed sideways, still the best methods of passing on customs. Some of the women potters have actually conducted classes for other Navajo women. The revival of interest, spurred by the success of Alice Cling, Lorraine Williams, and a few others, has gradually increased pottery production both for the market and for ceremonials. Among the best-known Navajo potters working today are Christine McHorse and Lucy McKelvey; they have joined other young clay artists from many Indian backgrounds, living and working in cities without the traditional tribal restrictions, but forging new concepts based on their cultures. Pottery was produced for functional and ceremonial purposes by all Indian groups on the West Coast; some of them developed unusually individual claywork styles. However, accomplished artists in other traditional crafts (notably basketry and wood carving) were the ones to become famous in this region, and were sought after by collectors. These works varied from group to group. Like the Indians of the Southwest, the sparse populations of West Coast Indians in California were influenced by Spanish conquistadors and missionaries. Unlike the Southwest Indian tribes, however, the Maidu, Yurok, Karok, Miwok, Pomo, and Mono cultures of California were great basket makers rather than potters. Still, some West Coast tribes did delve into clay - for instance, the Maricopa and Mojave Indians, who did develop an interesting claywork style. Some of the world's finest sculpture originated on the Northwest coast, but it was not in clay. The magnificent wooden totems and masks of the Tlingit, Haida, Inuit, and Kwakiutl are legendary and are generally carved by superbly talented men in these northwestern tribes. In an essay in The World of the American Indian (National Geographic Society, 1993) the uncommon professor, poet, and historian N. Scott Momaday summed up the nature of Indian aesthetics: "In my experience Indian art, in its highest expression, is at once universal and unique. It is the essence of abstraction, and the abstraction of essences. "The Indian's perception is humane. It is centered upon an ideal understanding of man in the whole context of his humanity; it is therefore an ethical perception, a moral regard for the beings, animal and inanimate, among which man must live his life. "I believe that the American Indian is possessed of a vision that is unique, a perception of the human condition that distinguishes him as a man and as a race. I suggest some aspects of this perception which seem to me definitive. In terms of these considerations - the sense of place, of the sacred, of the beautiful, of humanity - the Indian has had and continues to have a singular and vital role in the story of man on this planet." All text © Susan Peterson. © 1997 Abbeville Press and The National Museum of Women in the Arts.